1. Firstly, pick a sheet from your First Edition Paradise Crush 12x12 paper pad and cut it down to fit the size of your photo frame. Adhere with Dovecraft Perma Fix tape to the back of your frame. 2. Cut out the Simply Creative Chipboard Alphabet stickers and arrange your words on your Paradise Crush sheet. TIP Cutting out the sticker allows you to be able to move the position of each sticker before permanently sticking them down to your sheet. Also check the position of your words by placing the frame over the layout to make sure that no stickers are hidden. 3. Add a selection of sequins and Simply Creative gems in the corners of your layout to add interest. You can give your project a simple look or a more detailed one, the crafty choice is in your hands! 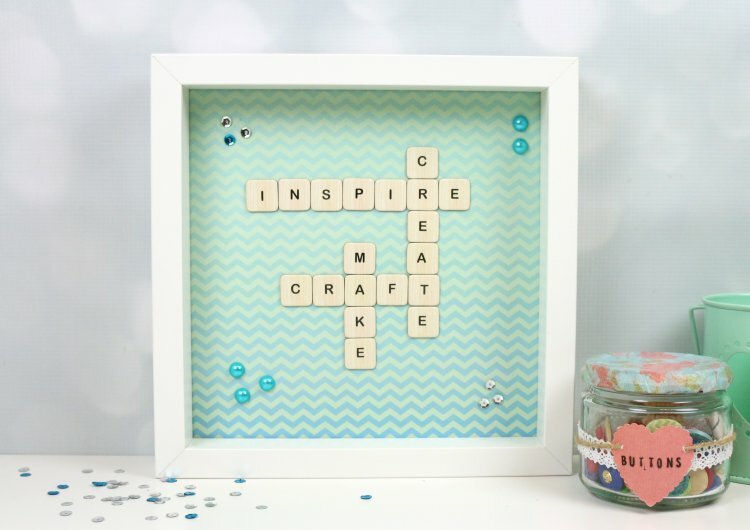 This frame would look so sweet in any crafters home! You can use the Simply Creative stickers to create a variety of words for different occasions. This technique isn’t limited to home décor, why not try it on your next card making project? Remember to upload your gorgeous makes to the project gallery and to #trimcraft when uploading to social media!